GM SST Lift Kit - Max Lift: 4.0"F/3.0"R - Max Tire Dia: 33"
For use with Factory ALUMINUM Knuckle Suspension or Stamped Steel Front Suspension. Not for use on cast steel suspension. Not for use on AWD vehicles. 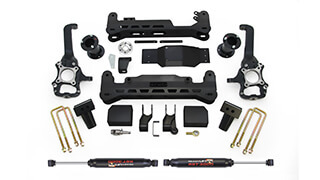 ReadyLIFT is proud to offer a SST Lift Kit system for the 2015-2019 1500-series GM 6-lug 4WD SUV/SUTs with factory Aluminum suspension. The 69-3496 4.0" SST Lift Kit is the result of over six months of extensive product development followed by rigorous on and off road testing. ReadyLIFT's goal is to provide a true 4.0" lift kit that is completely bolt-on; no drilling, cutting or welding required. This system significantly increases ground clearance while allowing for tire sizes up to 33" tire on an aftermarket wheel. The most common tire size for this application is 33x12.50 (max). In order to install a 33x12.50 (305/55/20) with aftermarket wheels, some minor trimming of the inner fenderwell may be required. 22x9.5 with 5.5" backspacing requires no fender modifications. 17x9 +0 offset on a 285/70R17 will fit with no rubbing. With a 295/70r17 minor trimming/modification required. Note: This kit is designed for use with aftermarket wheels. 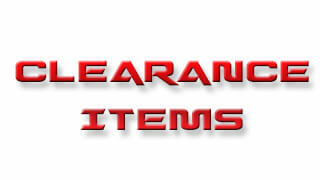 Not for use on AWD vehicles. The ReadyLIFT 4.0" SST Lift Kit will raise the 2015-2019 Chevy Suburban, Chevy Tahoe and GMC Yukon 1500 4WD SUVs 4.0" in front thanks to tough trail-proven 4.0" powdercoated steel strut extensions that bolt directly to the top of the factory strut. 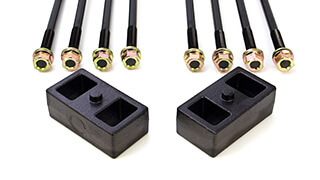 Unlike some kits which require you to cut off your strut studs or break the top hat seal which are irreversible modifications, our rugged strut extensions require No Modifications to be made to the strut in order to install the extension. 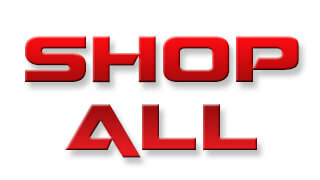 This guarantees the strut will maintain the factory integrity as well as drastically reducing installation time. 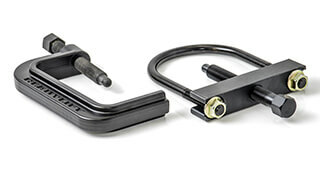 Two key products were developed to make achieving 4" of lift without modifications a possibly. At the heart of the system is our all-new 100% DOM tubular upper control arm. 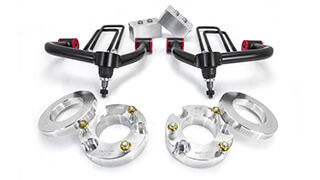 This new heavy-duty control arm features OEM-style ball joints pre-pressed into a strong crown that retains OEM geometry throughout the suspension cycle and doesn't require any modifications to the spindle. That means no drilling or machining to make the ball joints fit the spindle. 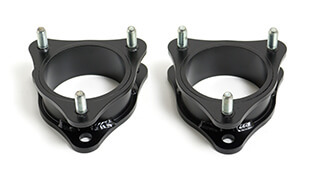 The new Control Arms include TCT polyurethane bushings. The second important product that makes this kit possible is our Patent Pending CNC-machined 6061-T6 billet Aluminum differential drop brackets. When raising the front suspension 4.0" the differential must be lowered to maintain front axle and CV angles. 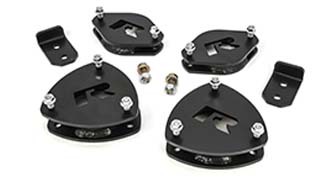 ReadyLIFT has engineered a differential drop system that cuts installation time in half compared to other similar kits. Unlike other differential drop brackets made from steel plate that bends and can cause CV failure, our CNC-machined brackets cannot ever bend, break or cause any driveline problems when using 4WD mode. That is guaranteed! 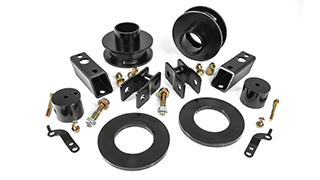 Accompanying our patent pending differential drop brackets is a thick powdercoated plate steel skid plate that utilizes the factory attachment locations for ease of installation while providing tough differential protection when off roading. To lift the rear of the GM coil spring-equipped SUVs, this lift system includes 3.0" powdercoated steel coil spring spacers. The strong coil spacers insert into and top of the factory spring which maintains the great factory ride! In addition, a slight rake is helpful for towing or hauling. New longer and stronger rear sway bar end links and bump stop extensions are also provided to keep the rear suspension working properly. 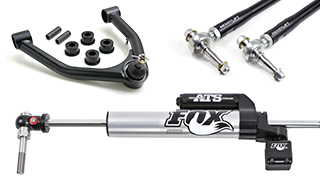 Completing this great new lift system are a set of steel rear shock extensions. 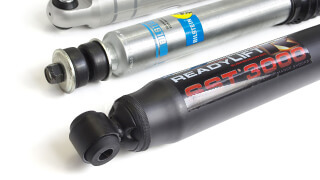 No need to replace your great-riding factory rear shocks with inferior aftermarket shocks. These new shock extension brackets keep the rear shocks in the factory mounting position which means your truck will ride great! And that's important! 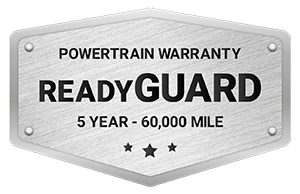 Like all ReadyLIFT products, the 69-3496 SST Lift Kit System is protected by our Limited Lifetime Warranty and ReadyGuard PowerTrain Warranty. NOTE: Note: This kit is designed for use with aftermarket wheels. 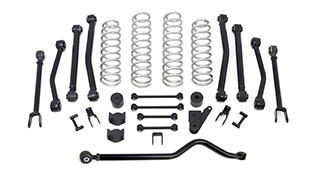 NOTE: Installation of these kits may cause rear axle shift and an adjustable rear track bar or drop bracket may be required. NOTE: Will not work with rear airbag suspension.